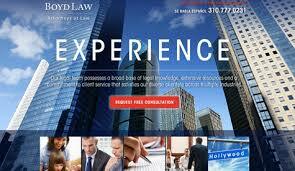 The three main Boyd Law offices are located in Los Angeles, San Diego, and Orange County, CA. The Los Angeles, CA family lawyers and San Diego, CA divorce attorneys at Boyd Law have many years of successful combined experience handling all different types of family and divorce law cases. Practice areas include but are not limited too: Divorce, military divorce, divorce modification, spousal support, alimony, adoption, child custody, child support, complex diovrce modifications, legal separation, domestic partnerships, high profile divorce cases, celebrity divorces, grandparents rights, visitation, relocation, and many many more. The LA and SD family and divorce lawyers at Boyd Law are fully committed to providing each and everyone of their clients that they provide legal representation for with the best possible legal representation. Contact any of the Boyd Law offices for a free legal consultation and or case evaluation with one of California's best family and divorce law attorneys.